We are a small independent company with over 20 years experience in the decorative glass industry working with individuals, architects and interior designers. We have worked on a wide range of innovative and exciting projects and have the skills and experience necessary to turn your project into reality. From large scale commercial projects through to small scale domestic & residential we have the enthusiasm and commitment to detail that you would expect from a leading glass design company. From new designs and commissions, workshops and projects within schools, through to restoration of stained glass from churches and historic buildings. 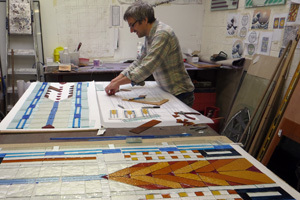 Our care, quality and attention to detail is second to none whether it be a front door panel, church window or large scale Public Art commission. View our portfolio on the projects page or via our Flickr Gallery. Contact us for more information or to make an enquiry.